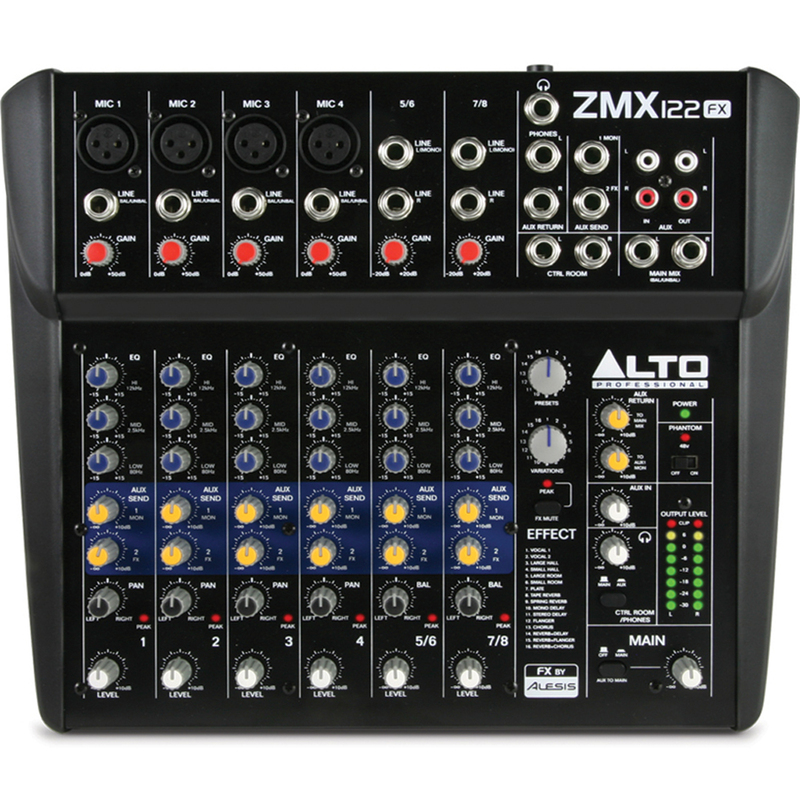 The ZMX122FX is an eight-channel, two-bus mixer with all the inputs, outputs, routing, EQ, and effects you need for more intimate live performance reinforcement situations. It features four microphone inputs with balanced TRS jacks (two with Phantom Power), a three-band EQ and two AUX sends on each of the four mono channels and the two stereo channels, and even two-track inputs for integrating audio playback devices. 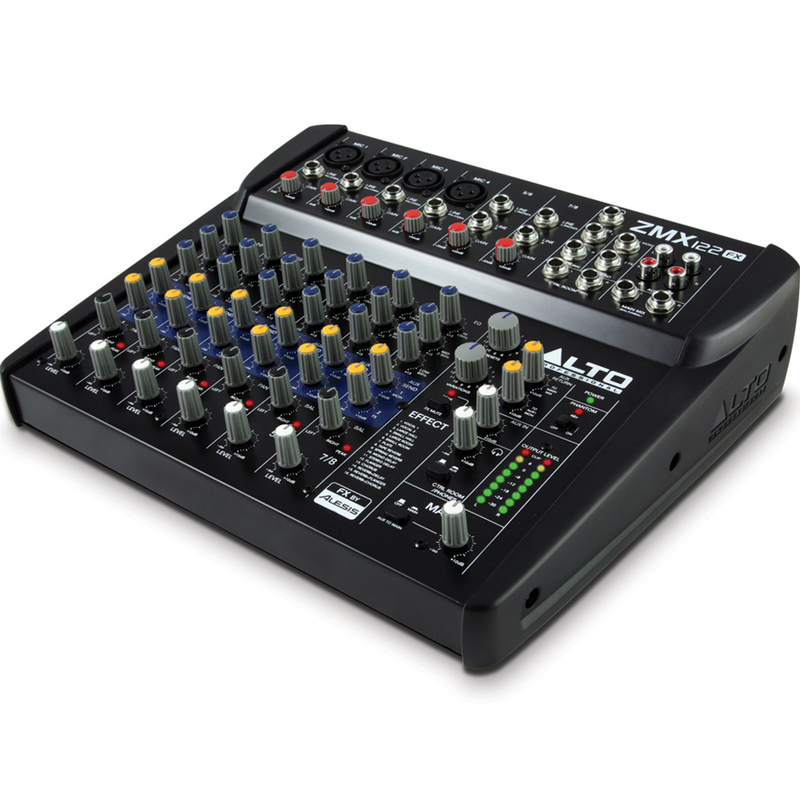 The ZMX122FX is a perfect, take-anywhere professional mixer. Regardless of what you're mixing, give your mix a professional edge with 256 onboard 24-bit DSP effects designed in partnership with Alesis, a coveted creator of sound-shaping digital effects that has been setting standards for DSP technology for nearly three decades. Choose from room and space delays, small and large hall acoustics, plate and spring reverbs, flangers, chorus effects and more. The ZMX122FX offers 16 variations of 16 professional Alesis effects from which to build, tweak, and dial in your sound. There's even a footswitch input so you can bypass all effects hands-free (footswitch not included). The ZMX122FX is the swiss army knife that your creative life needs. Not only can you can plug dynamic, condenser, and wireless microphones into the first four channels, but you also get two stereo channel inputs for keyboards, drum machines, and other instruments. Plus, you can easily plug in your MP3 player, CD player, or audio from a DVD player into the CD/TAPE inputs. You also have two AUX sends that you can use to send streams of audio from your mixer to a digital effects unit, stage monitor, or any number of sources. Choose the ZMX122FX as the audio central command for your live performances, home studio, or video suite. The ZMX122FX packs an enormous amount of features into a very compact space, but we took a no-compromise approach where the purity of your mix is concerned. This compact mixer brings the same standard of quality to your performances as our top-of-the-line models. 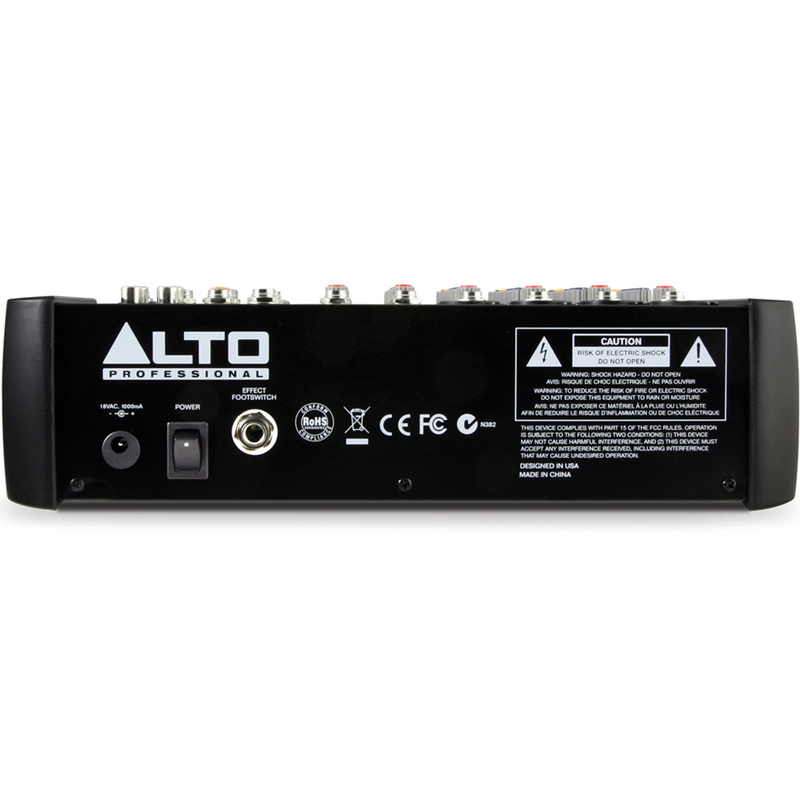 All Alto Professional ZMX mixers are designed with high headroom and ultra low-noise, discrete mic preamps so you always get the full dynamic range of your mix every time. Pristine sound. No compromises. We designed every ZMX mixer with your performance in mind. Oftentimes venues are dark and it can be hard to see what you're working with. Alto Professional solves this problem by not only color coding each section of the mixer, but also by using brightly colored knobs so that you can easily find what you need to adjust before you ever lay a finger on the mixer. Our blue, red, yellow and white pots are instantly easy to identify in dim lighting. LED indicators for output level, peak, and phantom power also assist in making sure that you have multiple visual cues that compliment everything you're hearing.